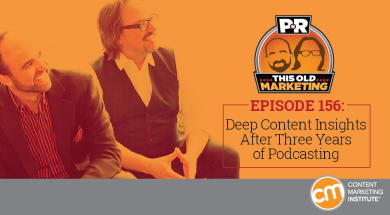 In our special three-year anniversary (and one millionth download) episode, Robert and I dig back into the archives and discuss what’s brought us success in our careers. We also share what we’ve seen work — and not work — in enterprises around the world when it comes to content marketing. Rants and raves include Forbes and Yahoo, then we wrap up with an example of the week: Chief Content Officer (CCO) magazine. To celebrate our three-year anniversary of This Old Marketing, Robert and I thought we would take a few minutes to reflect on the things that have brought us success in our lives, and share some personal stories on where we came from, how we got together, and how we came to do what we do — in the hope that it will inspire others in their own career journeys. Among the takeaways of Robert’s experiences is to trust your instincts when it comes to choosing a path, and a passion, to pursue — even if, on paper, your gut feelings seem to be leading you in an insane direction. For my part, I can’t emphasize enough just how strongly I believe in the process of writing down your goals, reviewing them on a regular basis, and sharing them with others. More than any other practice, doing this has been essential to realizing my ambitions. Curalate: 6 tips to lower your cost per click by 40%. Most media managers are investing their ad dollars in the right channels, yet many fail to employ best practices to ensure that their budgets are used wisely. Smarter content powers discovery for your brand and makes sure those moments of discovery turn into opportunities for action. Curalate’s guide, Winning Strategies for Facebook and Instagram Ads, shows you how simple changes can lower your cost per click by 40%, while delivering a 31% lift in return on ad spend. Download the guide now. Robert’s rave: Robert discusses a new book that he feels is absolutely required reading for content marketers. Competing Against Luck: The Story of Innovation and Customer Choice formally introduces Clayton M. Christensen’s “Jobs to be Done” framework, which is something we frequently use in our own teachings at Content Marketing Institute as a part of our persona development process. Not only is it insightful, it’s also simple, yet not simplistic, so it’s a breeze to read and absorb. Joe’s rant No. 1: Weight Watchers, a company that has been struggling financially of late, has experienced a recent stock surge, which caught my interest as a fan of its subscription model. But while checking out Yahoo Finance’s most recent coverage on the company, I noticed the title of one of the sponsored articles: 21 Completely Unsettling Wild West Photos. The completely irrelevant piece has me pleading with marketers to keep a closer eye on their native advertising strategies — and how they are being executed. Joe’s rant No. 2: As I conducted my research on the Forbes news story above, I was halted in my progress by the site’s Quote of the Day splash screen. This frustrates me to no end; but as I was ranting out loud, my son, Joshua, entered the room and showed me a handy little solution. If you would like to bypass this unnecessary feature, search for and download the “Forbes splash screen bypass” browser extension for Chrome (it’s likely available for other browsers, as well), and make it disappear for good. 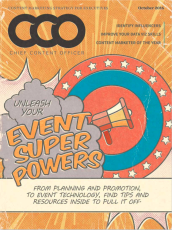 As part of our special third anniversary show, we thought we’d focus on an effort that is a particular point of pride in the CMI family: our print publication, Chief Content Officer magazine (CCO). (If you aren’t already familiar with it, you can sign up for your free subscription here.) Back when we were first getting CMI off the ground, we knew we wanted the business to follow the “three-legged stool” model for becoming the leading expert in our industry. To achieve this goal, the model dictates that you need to produce the leading digital platform, the leading print platform, and the leading event platform. This is the exact plan we pursued (in order), which I believe was a key reason we were able to achieve our leadership position so quickly. Recently, our team took a good hard look at the magazine’s metrics to evaluate how strongly it was continuing to contribute to our overall marketing efforts. In measuring its performance against four critical business categories of measurement — campaigns, competency, customer value, and cash — we discovered that the magazine continues to fire on all cylinders. Among our findings: We can attribute approximately 10% of our revenue to people who subscribe to the magazine. In addition, the data profiles we gather from our subscribers help us better understand our audience, which enables us to make more competent business decisions and share the resulting insights with those subscribers. Our ability to definitively correlate CCO with our ongoing success makes the publication a remarkable This Old Marketing example of an effort that pays for itself, while also offering multiple lines of business value.